The stronghold of Deephall was once home to a thriving, peaceful community, but now the mountain city lies under constant threat of invasion. A horde of undead, led by dark priests, attacks Deephall constantly. These unending attacks deplete the city's guards and erode the peoples' resolve. Four heroes are all that stands between Deephall and the city's extinction. 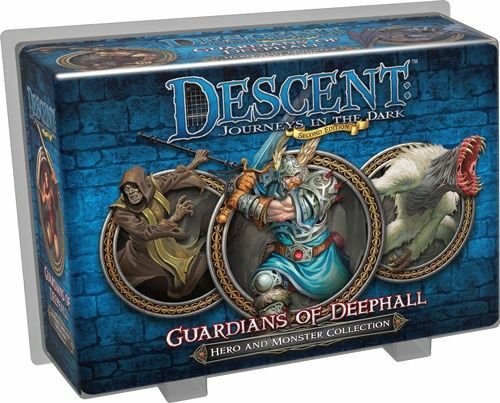 Descent: Journeys in the Dark (Second Edition) – Guardians of Deephall contains four heroes and three monster groups; these figures were previously available in the first edition of Descent, but are now brought in line with second edition aesthetics through reimagined figure sculpts and artwork. You'll find the orc warrior Mordrog battling in the front lines alongside Lord Hawthorne. At the same time, Sahla, a gifted Healer, focuses his power by channeling the strength of other heroes, even as the deadly assassin known as Silhouette uses her stealth and cunning to cut her enemies down. The battle for Deephall's fate plays out in two new quests. In \"Guardians of Deephall\", the heroes must defend the walls of Deephall against a seemingly endless assault of undead and dark priests. Then, in \"The Curse of Iona\", the hero party must venture into the icy lair of a dragon sorceress to reclaim a pendant that may be Deephall's salvation.